These acronyms represent the number ("S" stands for single, "D" for double) of poles and throws of a switch, one of its most fundamental characteristics. Poles are the number of circuits the switch can control, and throws represent the number of positions in which a switch can close a circuit. So then, single pole (SP) switches control only one electrical circuit; double pole (DP) switches control two, acting like two identical switches that are mechanically linked, and triple pole can control three, etc. Similarly, single throw (ST) switches close a circuit at only one position, whereas double throw (DT) switches can close a circuit in the up OR down position. A DT switch can also have a center position (usually configured as On-Off-On). Another circuitry consideration is how a switch is de-activated. A momentary switch is one that's only active when engaged by the user. Maintained switches, however, stay in the position you set them in until somebody comes along to flip them back. How will you know the difference, beyond hitting the switch? Look closely at the text written on the switch; momentary switches will have their settings noted in parentheses, such as "(ON)", while a maintained one would be simply marked "ON." You might also see this noted as "mom on" or "momentary on". 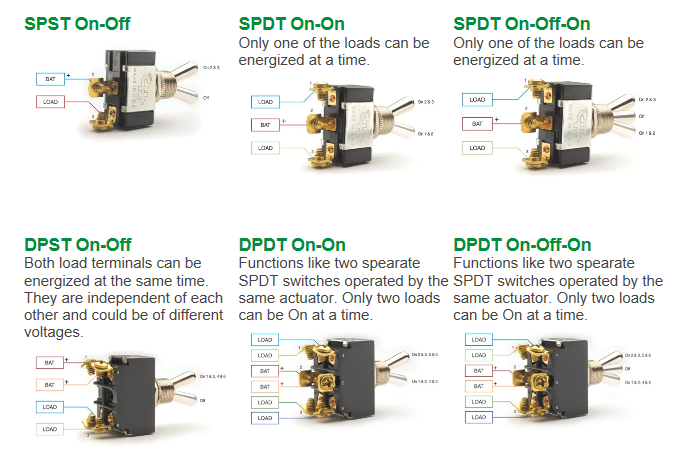 Here are some of the most common types of switches and their applications. 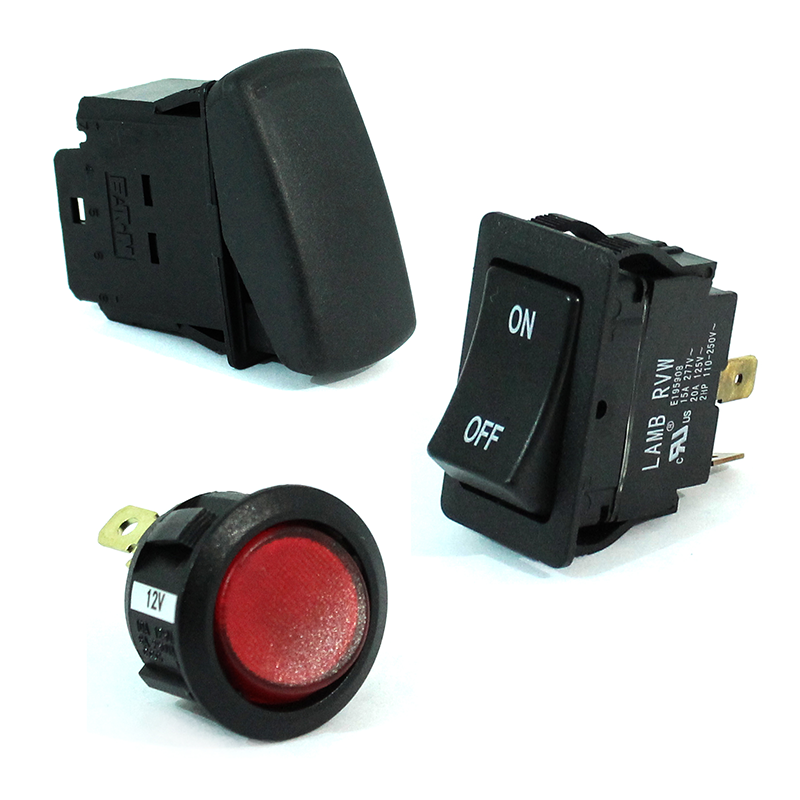 Rocker switches have numerous mechanical applications for automotive, machinery, and industrial. They can be illuminated to indicate the on and off status, making them an excellent fit for dashboard functions such as lights and auxiliary functions. Rockers also work well in forward-reverse applications, such as the 56027 / 58027 Series by Littelfuse (pictured right). Toggle switches are manually activated by a lever or another mechanism. While the basic light switch is probably the best-known example, they can be utilized in almost any type of commercial vehicle application, a great example being sealed model G-Series by Carling (pictured right). Push-button switches are a type of momentary switch that operates when activated by push, as the name suggests. Automotive horns are one common application for this type of switch; door jam switches, such as the Momentary Door Switches by Cole Hersee (pictured right), are another. 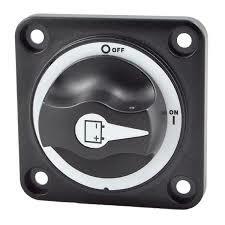 One popular sub-type of the push-button category is anti-vandal switches. These switches are named as such since they are commonly used on kiosk and public ticket dispenser applications, but are also favored by many other types of commercial equipment manufacturers for their rugged durability. The PV (pictured right) and ULV Series by E-Switch are both industry favorites in this category. Rotary switches, such as the V-Series Contura by Carling (pictured right), are operated by rotation, used when multiple positions are needed. This category includes ignition, battery selector, and disconnect switches. Disconnect switches cut off the electrical load going from the battery to the rest of the system. Switches like the Terra SR Series from Cole Hersee (pictured right) are commonly used for safety and avoiding battery drain when a vehicle is idle for a period of time. Some disconnects offer additional features such as lock-out/tag-outs and detachable keys and handles. Switch terminology can be confusing, but it's easy to get the hang of, much like a switch itself. If you're looking for the best in switches, no matter how many poles and throws, please view our complete selection of switches.